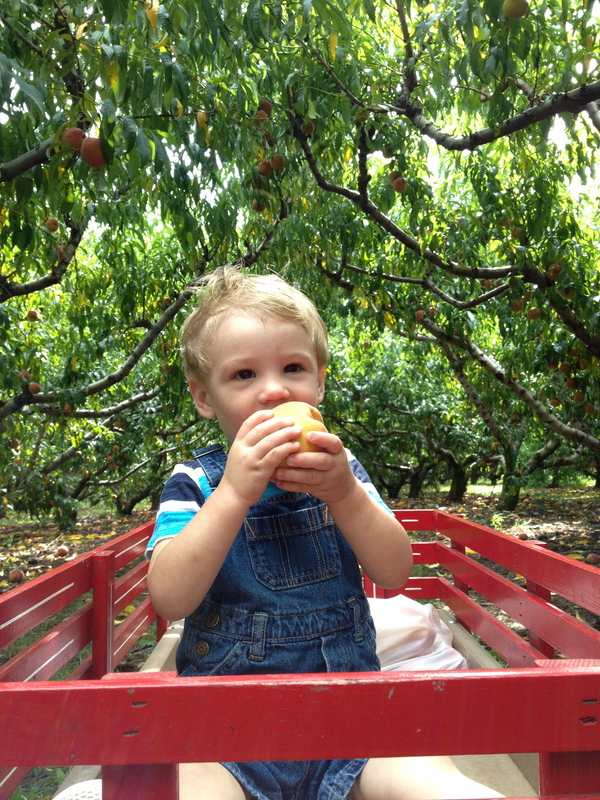 It’s the last few weeks of Summer here in Central Virginia so what better way to end the summer than with a visit to our local Peach Orchard. If you live within a 2 hour drive of Charlottesville, Virginia I strongly suggest you check out Chiles Peach Orchard. We drove the quick 30 minutes from our house to the orchard with our four boys. This trip we picked a little less than 20 pounds of peaches (a family of 6 can quickly pick 20 pounds of peaches). Usually we pick more than that and I make and can peach preserves among other things, last year I made our baby’s food with the fresh peaches this year he is sneaking the peaches out of the bag to eat on our way out of the orchard. This year with our peaches I just made a peach crumble. Here is a picture of it before it went in the oven. I couldn’t get a picture of it when it came out since my husband took it out of the oven and started putting it on plates. I usually am very good at making things like this but it didn’t turn out to well. I used a different crumble recipe (should have just called my mom) and the peaches weren’t as soft as they should have been but all the kids and my husband liked it and that is what matters. I won’t give out the recipe I used because I didn’t like it but now that I know how my mom makes it I will share that. Mom says that this can be used with any fruit. She is going to make an apple crumble with the apples from her tree (I’ll make one later this fall after we pick apples). toss 5-6 cups fruit in 1 cup sugar (you can add some cinnamon if you want). Mix up 1 cup brown sugar, 1 cup all purpose flour, 1 cup oats. Once you have those ingredients stirred together using a pastry cutter or fork and cut in one stick unsalted butter (softened) until it’s all nice and crumbly. 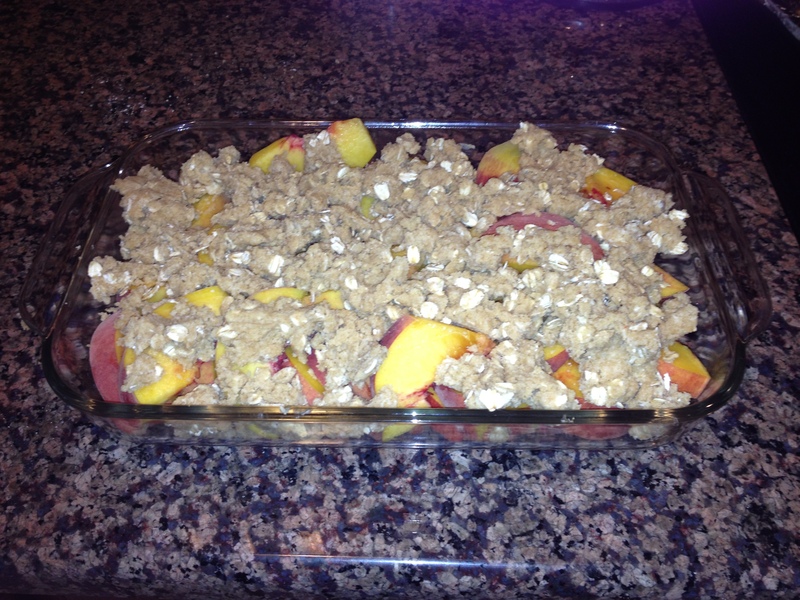 Put your fruit in a baking dish and cover with the crumble ingredients. Bake at 350 degree for about 30 minutes. Don’t worry if its all bubbly at the bottom that is usually what I look for. You can eat it right out of the oven or let it cool for 15 minutes. My boys won’t wait that long so we usually have it right out of the oven. I hope you enjoy the crumble as much as we do. 1 Response to Peaches! Peaches! Peaches! This made me hungry. I love peaches and I cannot believe I let the summer fly by without snarfing down several pounds of them.